If you have VPOP3 Enterprise you may want to limit the size of users' mailboxes to avoid filling up the server disk too quickly, and to encourage good management of the users' mailboxes. To set a quota, click Users at the top of the VPOP3 settings page, double-click on the user's account and go to the Quotas tab. Mailbox Quota - set this to the maximum size (in MB - units of 1,048,576 bytes - 1024 x 1024 bytes) of the mailbox that you want to be allowed. If this is set to 0 (zero) then the mailbox quota feature is disabled for this user. 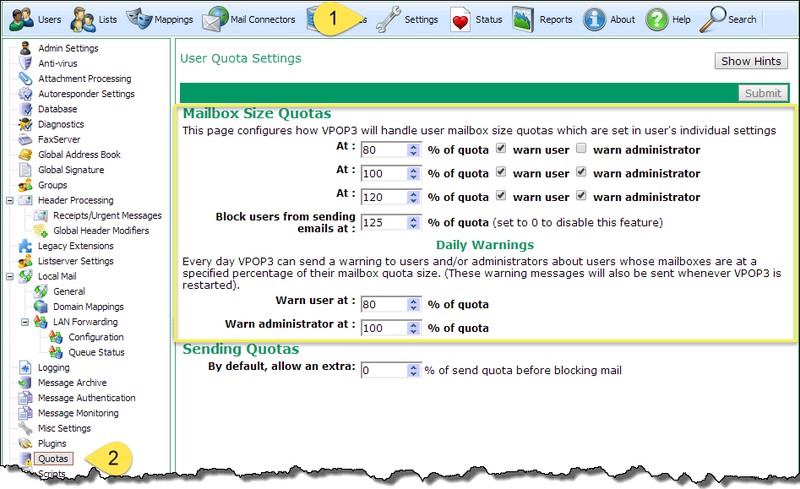 Note that the mailbox quota will not block any incoming messages for this user. As VPOP3 is a mail server designed for business use, it is considered too dangerous to arbitrarily reject messages just because a user hasn't managed their mailbox carefully. What the quotas do is configured in Settings -> Quotas. 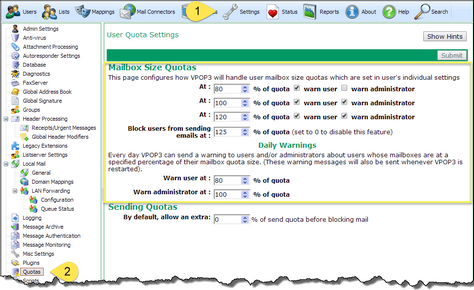 Quotas can alert users and/or administrators that their mailbox is large. They can also stop users from sending new messages, which will not prevent potentially important messages from reaching them, but will encourage them to clean up their mailboxes. You can set three levels at which alert messages will be sent out. These messages are sent when the mailbox size reaches the set limit. For instance, in the above screenshot, the user will be sent a message when the mailbox size reaches 80% of the quota limit. At 100% of the quota limit, both the user and administrator will be sent a message, and again at 120%. You can also set a limit at which the user will be blocked from sending messages - in the above screenshot this is set to 125% of quota size. For blocking sent messages, it is best to use SMTP authentication for sending messages. If you don't use SMTP authentication, VPOP3 will attempt to determine the sender by looking at the sender's email address, but this is not secure. As well as messages when the mailbox size reaches a specified limit, you can choose to send out daily emails to users and/or the administrator to remind them that they are close to the limit. The user who receives the administrator warning messages is defined in Settings -> Admin Settings -> Message Targets as the "MailboxQuota" target user. This defaults to the Main Administrator who receives all other error messages as well.